My guest post today is from my good friend Kristine from Flowers by Kristine. We met a few years ago at a bridal expo and since then have worked a TON of weddings together! She one of the florists on my Preferred Vendors List (email me if you'd like a copy! ), and she does seriously amazing work. She keeps herself educated on current trends in the industry and while I know she has certain styles she gravitates toward, her work is always different and no two weddings are the same. I asked Kristine a few questions about wedding florals and her business. Q: What is the first thing people should consider when planning their wedding florals? A: The first decision to make when you begin planning your wedding flowers is your color scheme. A palette with 2 or 3 main colors and 1 or 2 accent colors is ideal. Q: What are the hot trends in wedding flowers right now? The biggest trend I have noticed recently is a focus on lush greenery. Bridesmaids bouquets and centerpieces with more greenery than blooms and long greenery garlands down the center of the table have been very popular. I even designed several greenery chandeliers which has been so much fun! Many brides are also choosing looser more organic design styles as opposed to the more round and compact designs that were the norm several years ago. A: My absolute favorite part of my job is designing the bridal bouquet. No matter how big my business gets in the future I will always be the one to design each and every bridal bouquet! Q: As a florist, what is your dream job? A: I feel that I got so lucky in that I found what I love to do so early in life. My job allows me to be creative with an already beautiful product. I love hearing about each bride’s vision and seeing their vision come together on their wedding day. I love that every week is different because no two weddings are the same. 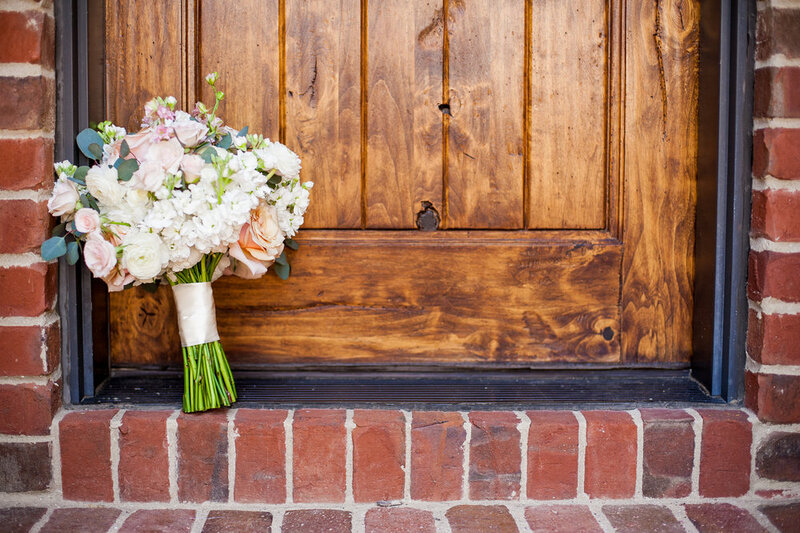 Q: What are the most popular flowers or colors for brides in our area? A: In the past couple years I have designed a ton of weddings with a color palette of pale pinks, neutrals, whites and ivories. My entire Instagram feed was filled up with that color scheme for a while there. That palette is still holding strong but I’m seeing many brides are choosing to add rich saturated colors like burgundy, marsala, plum, and sangria to the mix. Personally, I love the contrast of neutrals and rich colors together so I am definitely on board with this trend. Q: Any questions I didn't ask? A: Is it counterproductive to look at Pinterest? In my opinion, not at all! Some people believe that Pinterest gives brides unrealistic expectations. While it is true that the bride on the average budget may not be able to afford some of the huge, elaborate designs packed with blooms, it is still a great place to find inspiration. And even more importantly, since planning your wedding flowers is the first time many brides will really delve into the world of floral design, it is a great place to figure out your tastes in floral design and the styles and blooms you prefer and don’t prefer. Thanks Kristine for sharing with us today! I can't wait to see what you design in 2017!